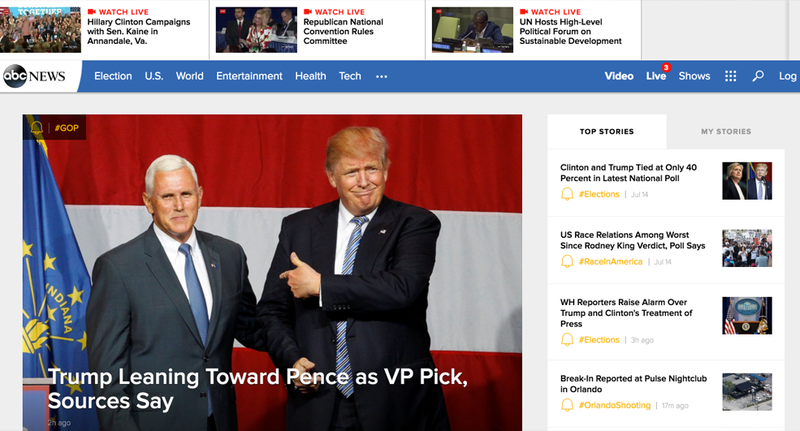 Ahead of the upcoming convention coverage, ABC News has rolled out a redesigned homepage as well as key updates to its mobile and OTT apps. Below is a list of the highlights of the new apps, according to ABC News. Live multi-stream experience: New functionality allows users to watch multiple live streams at once; users can access up to 8 live streams directly from the top shelf of the Apple TV home screen. ABC News is also introducing a special event feature for mobile and web, with a unique design that brings text, video, photo, and live updates front-and-center during major events and breaking news. I’m excited to announce that today we launch our new homepage, along with new apps for iPhone, Android, and Apple TV. Over the last many months, the product and audience development teams have been hard at work to develop products that enhance the user experience and provide for seamless consumption across every screen. We’ve added new video capabilities, including a live multi-stream offering that supports up to 8 simultaneous streams, as well as cross-platform push alerts with even greater personalization and sophistication. Over time, push alerts may become the primary discovery point of our stories on mobile devices. Our goal is to offer our audience the smartest and most helpful alerts, better than any publisher in the world. A big thanks to Doug Vance, Kristen Hague, Steve Hsu, Ryan Cardone, Anthony Castellano, Marc Rullo and the entire technology team, as well as all who provided their thoughts and feedback as we take this major step forward in reimagining storytelling for the modern audience. I encourage everyone to go to visit the new site homepage and download our new apps (if you haven’t already). We’ve created a slack channel called #product_pitches for candid feedback and will thoughtfully consider each submission. This is just the start. Always putting our audience first, we will deliberately and relentlessly evolve to lead the industry in defining the future of news and storytelling.